My kids go back to school this week – my daughter will be starting 8th grade and my son will be in 6th. They are growing up much too fast and I wish time would slow down a little bit! When I asked them what they wanted for their school lunch treat this week, they both said chocolate cookies. I found this recipe on Food and Wine that looked perfect. 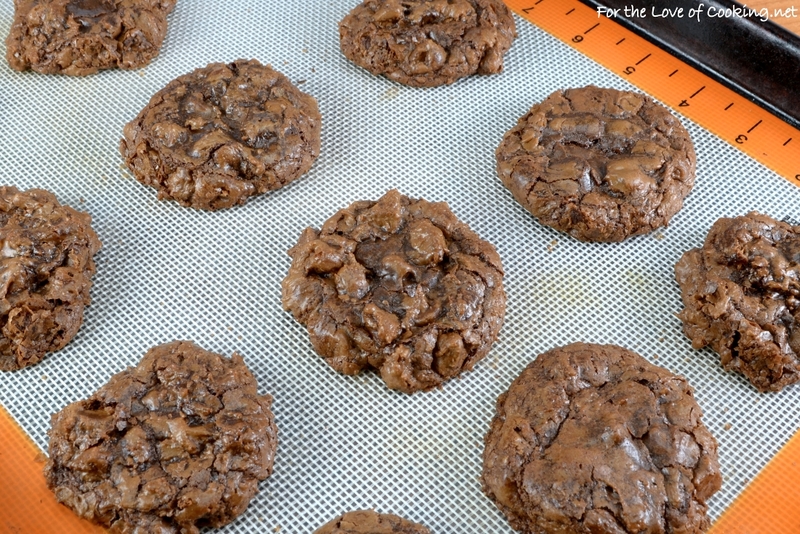 These chocolate brownie cookies took a little more time to make but my kids absolutely love them, so it was worth the effort. Whisk the flour, baking powder, and salt together until well combined. In a glass bowl set over a saucepan of simmering water, melt the chopped semi sweet chocolate with the butter, stirring occasionally, until smooth, about 7-8 minutes. In another large bowl, using a handheld mixer, beat the eggs with the sugar until thick and pale, about 5 minutes; beat in the vanilla. Using a rubber spatula, fold in the melted chocolate, then fold in the flour, baking powder, and salt mixture. Stir in the chocolate chips. Scrape the batter off the side of the bowl then place into the freezer for 20-30 minutes, or until firm.